WHICH FLY ROD IS RIGHT FOR YOU? You should use the fly rod chart above is a general guide to assist you in determining which rod would be best for your fishing needs based on certain criteria. If you live or fish small streams you will more often want to use a light presentation rod because of all the overhanging brush, shrubs, limbs, or trees that tend to grow along the edges of small streams. This most often means that you will be using a shorter fly rod so that your fly line does not get hung up on these obstructions. If you live or fish the large lakes, reservoirs, and rivers in the western U.S. you will find that an 8 ft. or 9 ft. rod works just perfectly. Generally, the longer the rod the farther you can cast your line. 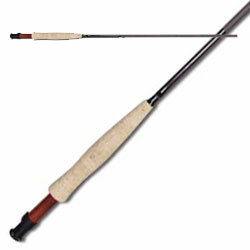 The most popular fly rod is a #5 matched with #5 fly line. If you fish for salmon, steelhead or other larger freshwater creatures or if you love to fish the salt, you should seriously look at a longer fly rod. When sight fishing, often times your target is quite a long way off and you'll need all the power your rod has to give. If you are buying a fly rod for a child it would be a good idea to use a line weight one number higher that the suggested line weight for the rod. This will help your "little one" load the rod more easily during the cast. It's akin to lowering the basketball hoop to compensate for the height of the child. If you wish more information or have individual specific requirements or questions, please get in touch with our team.